After my lukewarm review of the film of Patriot Games (1992) and singularly negative reaction to Paramount Home Entertainment's eye-straining, DNR-ridden video transfer, I wasn't holding out much hope for The Hunt for Red October (1990), Patriot Games' big screen precursor. Both movies received the same kind of mixed reviews when they were new, but with 15+ years of hindsight they're now a world apart. Though I remember catching Patriot Games at a mid-week matinee, I may only have seen The Hunt for Red October on laserdisc. I thought it was just okay at the time but on Blu-ray disc I sat there pretty much flabbergasted by how good just about every facet of this picture is, especially compared to Patriot Games, which makes all sorts of clunky, dramatically unsound mistakes telling its story. 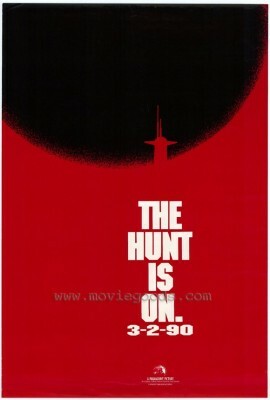 The Hunt for Red October, by contrast, is practically perfect, dated only in some of its Cold War ideology. The Blu-ray disc is also something of a revelation. After Patriot Games I braced myself for the worst. Lo and behold, it turns out to be a wonderful transfer and like the original films, everything wrong with the Patriot Games transfer is absent here. The difference between the two discs is practically night and day. Jack Ryan (Alec Baldwin) is a military analyst for the C.I.A. disturbed by reconnaissance photographs of the latest Soviet ballistic missile submarine, the Red October, photos that hint at a silent propulsion system that will allow it to prowl the seas undetected, thus giving it first-strike capabilities against the United States. At the same time, the submarine's highly respected Lithuanian captain, Marko Ramius (Sean Connery), recently a widower, is acting strangely. Just as the submarine's maiden voyage gets underway he murders his official Soviet government representative and takes possession of the second key needed to launch its nuclear payload. Pretty soon all hell breaks loose in both Washington and in Moscow. What's Ramius up to? Has he gone mad a la General Ripper in Dr. Strangelove and plans to personally launch an attack against the United States? Is he plotting an elaborate defection with his hand-picked crew of executive officers? Or is it something else entirely? Could Ramius be the vanguard of a secret mass attack on America by the entire Soviet fleet? Should the U.S. Navy launch its own rescue mission, help a potentially defecting submarine crew, or destroy the sub before it reaches the East Coast of the United States? The Hunt for Red October is a marvelous film, expertly adapted from Tom Clancy's 1984 novel by Larry Ferguson and Donald Stewart. (Except for Stewart's co-screenplay credit on Costa-Gavras' Missing, neither has any other significant credits and a few really bad ones, which is surprising.) For starters, in stark contrast to Jack Ryan's practically non-existent characterization in Patriot Games, despite big chunks of that film devoted to his private life, in The Hunt for Red October Ryan is a rich character that shrewdly evolves though his decisions, actions, and creative thinking. A few lines are tossed off here and there about his background, but basically he's a character we come to understand and respect because of what he does in the film, not because he's played by Harrison Ford, and Harrison Ford always plays the good guy. It's really astounding that Paramount didn't pounce on the picture's success, study it to see what made it tick and proceeded to crank out a long series of successful Jack Ryan movies, instead of the dribble of so-so thrillers that eventually straggled into theaters. They had in their hot little hands an American James Bond, a character for the late- and post-Cold War era, a scholar who turned to carefully considered research rather gadgets and bravado. The Hunt for Red October is a perfect introduction to the character. Sean Connery is the big draw and he's excellent (it's one of his best later-career performances) yet the mystery about this ambiguous character serves to make Ryan the more attractive, identifiable character. A notably youthful Baldwin is very good, and supported all around by a superb cast: Scott Glenn, James Earl Jones, Joss Ackland, Richard Jordan, Tim Curry, Jeffrey Jones. Ferguson and Stewart make a number of changes in adapting Clancy's novel, all of them good. In Clancy's story Ryan practically never leaves his desk in Washington, D.C., but here the screenwriters believably drop him into the thick of the action, connecting it all with some good ideas (such as Ryan's inability to sleep on airplanes because of turbulence). In the novel, politically conservative Clancy blamed the evils of socialized medicine (!) for Ramius's actions, but in the film the captain's motivations are much more ambiguous, less didactic. Other deceptively simple decisions by director John McTiernan and others help the film in clever little ways: interiors of the seagoing vessels are lit and/or painted distinguishably different colors, so that the viewer always knows which vessel is being shown at any given moment. Another great idea was to introduce Connery and Neill's characters in an exterior shot atop the Red October's sail, then pull back in an elaborate aerial shot to reveal the enormity of the full-size sub. (It's not CGI, but a full-size floating mock up built on barges. It's positively humongous.) What this shot does is immediately establishes credibility so that once the audience is locked away inside sub and ship interiors for much the rest of the movie they don't feel like sets. We've seen this thing and just how huge it is and gladly suspend out disbelief for the remainder of the film. Indeed, throughout the film it's hard to tell what's real and what's a set, an impressive accomplishment. Contrasting Patriot Games' disastrous overuse of digital noise reduction (DNR), The Hunt for Red October on big TVs does a fine job approximating the experience of watching the film on a big movie screen. Throughout, the 1080p image is film-like and never appears digitally mucked up. Filmed in Panavision, DP Jan de Bont's cinematography favors shallow focus and rack-focus shots; there are even some shots here and there which are slightly out of focus, as if the actor missed his mark by a few inches. During all this the visual integrity of the image is never compromised, even in the film's optically-added (by Industrial Light & Magic) torrential rainstorm. Red October's previous incarnations on laserdisc and DVD were, as I recall, rather underwhelming. As standard-def footage included in the behind-the-scenes documentary seems to bear out, these earlier editions were excessively grainy due to the printing rather than as a reflection of the original negative. Here the image is significantly sharper with truer color, but without all the unnecessary digital meddling. Originally released in standard Dolby Stereo, the Blu-ray offers a remixed 5.1 Dolby Digital TrueHD track which is excellent; though the film is almost 20 years old, it's not a bad choice to demonstrate your home theater's sound system on. Also included are 5.1 Dolby Digital stereo tracks in French and Spanish, along with subtitles in all three languages plus Portuguese. A trailer for the film is likewise presented here in 1080p high-definition, though the remaining extras are carryovers from previous releases. There's a pretty good half-hour behind-the-scenes documentary, Beneath the Surface, in 16:9 standard-def, and an okay audio commentary with director John McTiernan. After Patriot Games I had expected a just-okay movie and a terrible transfer, but instead The Hunt for Red October turns out to be one of the best political/action thrillers of the last quarter-century, and the transfer makes the viewing experience a real pleasure indeed. Though the lack of significant new extras is disappointing, otherwise this is a DVD Talk Collector's Series Title.